We brought in this Noch HO scale preformed layout earlier this year for Dan Rudolph of Florida and he and his wife have done a fantastic job building and detailing it. 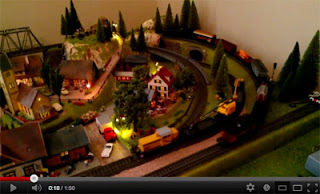 The model railroad is a great example of the fun and detail that can be had with a Noch preformed layout in a small space, even using Marklin HO scale track and trains. The Noch layout shown is the 81710 Schönmühlen Layout and can be built in either HO or N scale (or TT but no track plans are provided by Noch). We try to keep a number of Noch N/Z preformed layout in stock at all times. Due to the large size we usually do not keep many HO layouts in stock but can order in any layout as needed. Want to see a Noch layout in person? If you are in the Vancouver area for November 10th and 11th, come see us at the Trains 2012 show in Burnaby, BC. We will be bringing completed Noch HO 'Tannau' (Marklin digital) and N-scale 'Traunstein' layouts with us to the show! Updated: We got in touch with Dan and he graciously allowed us to post some of his photos of his layout as well. Click on the full-screen icon in the lower right of the window below for a larger view.